Last night I wondered if following the Olympic opening ceremony on Twitter without actually seeing it might be like a blind person trying to understand the concept of color. I saw exactly one image from the Opening Ceremony in the period between the live show and the East Coast viewing, when Jim Frederick posted a picture of farm animals. Wow, I thought. Way to open. I found out from @josholalia that the Queen went skydiving with James Bond and ended up popping out of a box. But it wasn’t just "any" box, I quickly learned from @maximolly, it was a NeXT computer with Tim Berners-Lee in it who then tweeted, "this is for everybody" and was instantly retweeted tens of thousands of times. Tweet after tweet filled the stream, each sounding more bizarre than the last. My imagination started running wild wondering about the reality of the Opening Ceremony as compared to the conceptual art being planted in my mind by people on the ground, television watchers, disinterested third parties whining about the stream being overtaken by tweets about the Opening Ceremony and professional journalists (although the concept of professional journalism remains under siege: NBC chose to edit out a solemn moment to acknowledge the Brits who died at the hands of terrorists days after the Olympics were announced). But the opening ceremony wasn’t just about the UK getting comfortable with its post-Empire identity. Like color, it was about more than visions. It was also about mood. How to explain to a blind person that bright yellow has a feeling? You share the playlist, which many of you did. And you give the spectacle a shape and feel by talking about the people behind it. The theme of the Opening Ceremony was British "creativity, eccentricity, daring and openness." My love of these traits in the Brits is no secret (hello, @HelenWalters!) But when you can't SEE what's happening, these ideas remain conceptual. 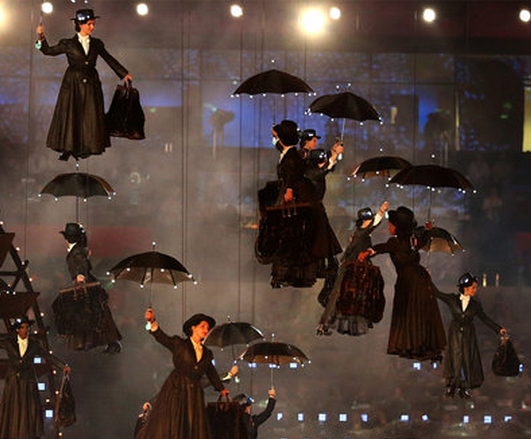 How exactly did the Brits put their eccentricity on display? Somewhere amidst the traumatized pasture animals; and Mr. Bean's reenactment of Chariots of Fire on the beach; and the parachute jumps of James Bond and the Queen from a helicopter; and the joint lighting of the cauldron by seven young British athletes, each chosen by a former Olympic great -- somewhere, that is to say, between Tour de France champion Bradley Wiggins' ringing of the Olympic Bell and the echo of Paul McCartney's final note of Hey Jude -- artistic director Danny Boyle smuggled into the Opening Ceremony of the London Olympics a worthy and important thing. He gave us a chance to celebrate protest and dissent. My concept of the Opening Ceremony was collaboratively created by all of you. I’ve still seen only three actual images: the farm animals, the women dressed like Florence Nightingale at the skating rink to comment on universal health care, and the Mary Poppins shot. The Imagination Age is so much fun.